Fiona has fallen immortally in love with the statue of a warrior! The little mermaid Fiona has fallen immortally in love with the statue of a warrior. She wants to bring it back to life and therefore asks a powerful but very dark power for assistance. Fiona must survive many adventures to manage all the tasks that the dark power imposes on her so that she does not end up sharing the same fate as the warrior...Start an exciting match-3 adventure and play through many challenging underwater levels! 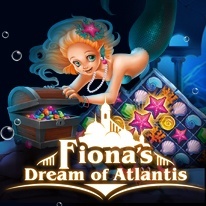 Solve exciting puzzles and bonuses, win upgrades and extras, and help Fiona fulfill her dream of Atlantis!